Dusty conditions continued around the red planet this past week, as the planet-encircling dust event was still ongoing. The colossal dust cloud was still prevalent between the south polar ice cap and the north polar hood. Solis-Sinai and on occasion, the Tharsis Montes region, experienced some local-to-regional scale dust lifting events. Condensate lee wave clouds, known for their washboard pattern, remained present above Tempe Terra. The peaks of the Tharsis Montes and Olympus Mons were discernible each afternoon. Throughout the week, rover sites, Endeavour Crater (Opportunity) and Gale Crater (Curiosity) continued to be concealed by clouds of dust. This week’s MARCI “movie” can be downloaded HERE (8.9 MB .mp4 file). This week’s MARCI “movie” can be downloaded HERE (8.9 MB .mov file). Malin, M. C., B. 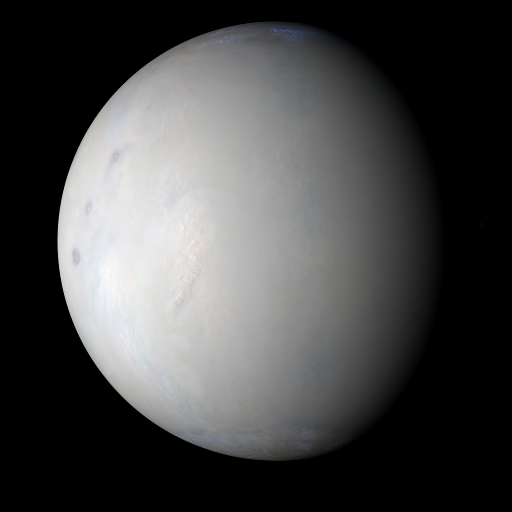 A. Cantor, A. W. Britton (2018), MRO MARCI Weather Report for the week of 2 July 2018 – 8 July 2018, Malin Space Science Systems Captioned Image Release, MSSS-538, http://www.msss.com/msss_images/2018/07/11/.